AOS judges at work at Long Beach center. Did this Dendrochilum win an award? We're still not sure. 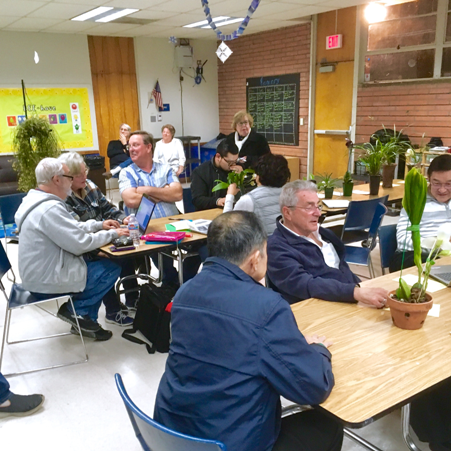 SCOS has for many years provided space for an official American Orchid Society (AOS) judging center during our monthly meetings. The current director of the Long Beach center is Peter Lin. The Long Beach site, in turn is a part of the Pacific South Judging Center. Visitors to the judging center are welcomed and encouraged! Provides an extensive educational resource for all orchid growers, professional and amateur alike, in matters of selecting desirable plants, growing them for best effect, and identifying them correctly. On the other hand, beauty is in the eye of the beholder. There is nothing wrong with preferring a particular plant that never won any awards, but nevertheless pleases YOU! Fashions in orchid flowers change over time. The judging system may not catch on to new trends immediately. Wow, I see spots! Look what turned up at the judging center recently! However, awarded plants are often the ones that are selected for cloning and mass marketing. Awarded plants are more likely to be used in breeding new hybrids as well. 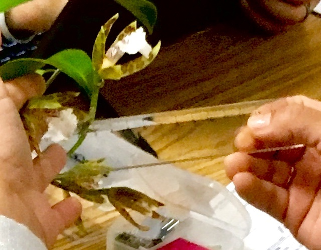 Over time, the judging program influences the direction of orchid breeding, growing, and marketing. One reason to be aware of the judging system is that you could easily end up with a first-bloom seedling that happens to turn out exceptionally well. Remember that seedling orchids from a given cross usually show many differences in form, color, growth habit, etc. Most seedlings of hybrid orchids are sold to the public before they have bloomed. Someone has to get the best plant from among the unbloomed seedlings of a particular cross, and that someone could well be you! 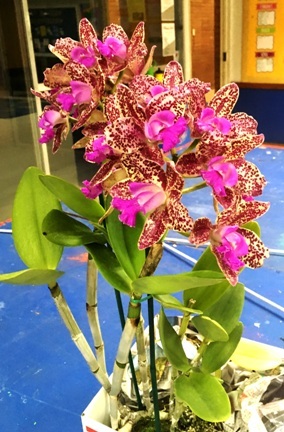 Bringing your plant to one of our meetings for judging is the way to find out if you have something special! 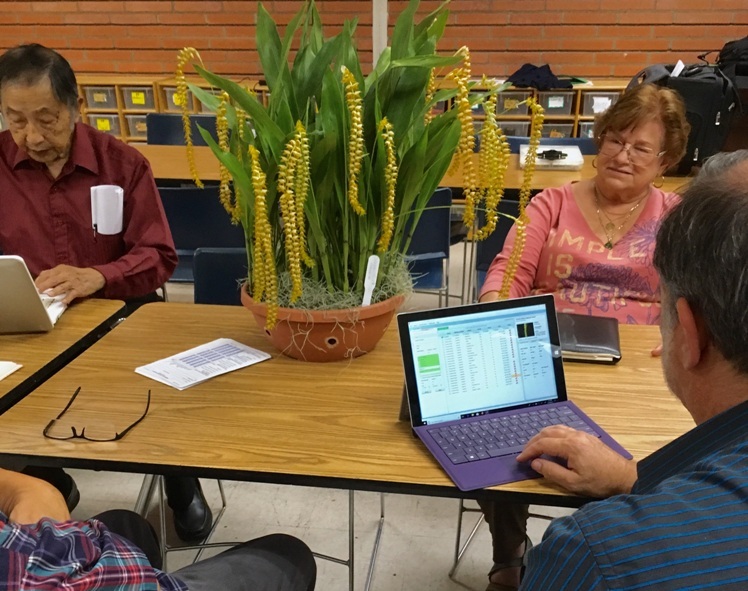 Most of the plants that win an AOS award at the Long Beach judging center will appear in the SCOS newsletter, an excellent resource for keeping track of who's growing what in our area. Busy night at the judging center. You never know how many plants will show up for judging. 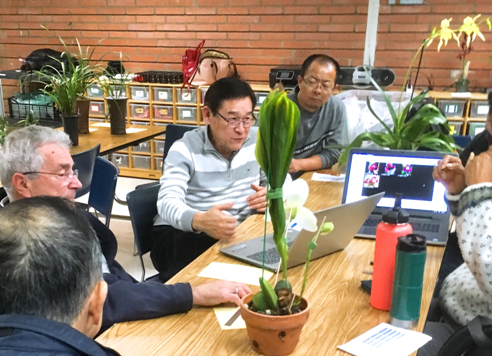 At a recent meeting, January 28, 2019, when Peter Lin was busy presenting a program at the SCOS meeting, the judging center found itself faced with 31 submitted plants, of which something like 22 were accepted for judging. 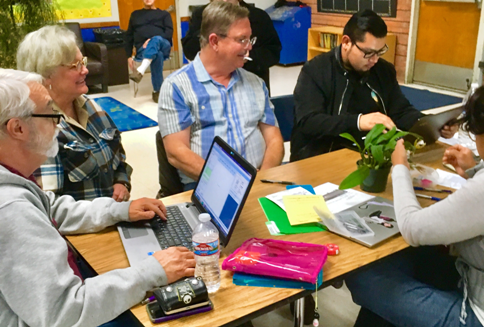 Visiting judges were pressed into service, but the process takes time. Modern judging tries to document everything. Even if the Dendrobium teretifolium (it's lurking in the background in a couple of these pictures, cascading from a basket on a plant stand, nearly reaching the floor) happens to have several hundred little flowers, somebody has to count them! All the flower parts (but not necessarily from every flower) have to be measured as well. And, to make the whole process more challenging, there's a deadline! We have to be out of the building by 9:30 PM, according to our contract with the Long Beach Parks Department, otherwise we will get charged extra. On this night, the judges had to move everything outside at 9:30 and complete their work on the concrete benches outside the Whaley Park meeting hall.